Northern MN Americana and Folky-Tonk duo, Adam Moe and Boyd Blomberg are Pushing Chain. Their newest CD "Sorrows Always Swim", recorded at The Congress House in Austin, TX with Mark Hallman, Bill Kirchen, Redd Volkaert, and Chris Gage is a great listen! 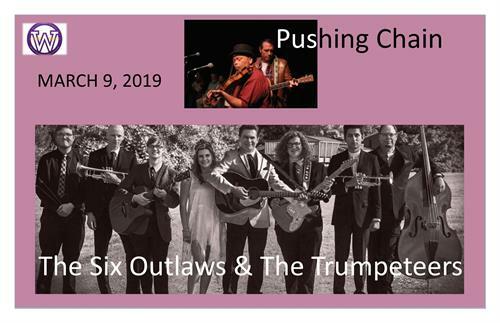 The Six Outlaws and the Trumpeteers hail from the Waconia area and present their Johnny Cash and Elvis renditions with unequaled enthusiasm! Come hear them in their first appearance in the Performing Arts Center!